There are a handful of hotels and apartments in close proximity to the Auckland Viaduct harbour, which is also adjacent to the central city (e.g. Queen street) for shopping, business needs and entertainment. The area is generally vibrant, and with viaduct restaurants, dining avenues, and quality accommodation, you can easily relax and enjoy yourself. Sometimes corporate events and shows, are present to add to the viaduct's atmosphere, and you can enjoy the Waitemata harbour views and local beaches along the Auckland waterfront. You can benefit from Auckland's viaduct harbour through charter tour packages, such as America's cup sailing and Kelly Tarlton's harbour cruises. There are also fishing, and charter harbour tours for your enjoyment. Also the ferries (fullers at http://www.fullers.co.nz/) to travel to Waiheke or Rangitoto and other adjacent islands. 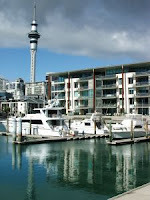 Visit online sites such as NZ Com, Viaduct NZ (http://www.viaduct.co.nz/), Auckland NZ (http://www.aucklandnz.com/), Tourism NZ (http://www.tourism.net.nz/) and other online searching for harbour charters. Image of the Viaduct By Sveres at SXC. Stylish and modern luxury apartments overlooking the harbour with over 100 studios, providing services and amenities as a hotel should. Harbour activities can be arranged - sailing, cruises, fishing, and more. Enjoy boutique styled apartments which are fully equipped with amenities, and surrounded with ponds and New Zealand native trees. Over 170 guest rooms within a fully functional hotel, with great views of the harbour. Includes event and wedding planning on their web site. Auckland Water Front Apartments (Princess Wharf, 143 Quay Street) Great harbour view, in 1 to 3 bedroom water front quality furnished apartments, with fully equipped kitchen and white ware and many other features. Overlooks the viaduct harbour with expansive marina views, with over 170 suites, with luxury restaurant and water side bar. Accommodates events, wedding, and special occasions. Ocean fresh restaurant with fresh fish and seafood dining. Includes bars, dining rooms, private functions and more. Authentic Hong Kong style dishes from prepared from trained chefs to yield Asian dishes to enjoy. Large venue to accommodate weddings and corporate events. Breakfast, Lunch, and dinners with drinks. Also has a loyalty club to organize events, meetings, and parties. Mediterranean/Spanish Food with a bit of New Zealand (Kiwi style) flavor. Breakfast, All day meals, cocktails, and desserts and of course beverages. There are many other restaurants, bars, and cafe's to visit, and to compliment your hotel accommodation within Auckland's viaduct harbour. Perhaps visit "eating out" (http://www.eatout.co.nz/) to view other restaurants within Auckland and New Zealand. So if you want to relax and enjoy viaduct harbour views for a while, in close proximity to central city with it's various attractions and venues, then perhaps a Auckland hotel for accommodation should be considered. Holiday accommodation runs from adjusted rooms right through to expansive occasion homes ideal for the entire crew. there are several restaurants and bars to enjoy a meal and drinks within the viaduct for dining and relaxation.